Once upon a time, a man named Massi went on a long journey, from a big city to a beautiful island far, far away, to visit old friends. Massi loved the island. It was warm and beautiful, with soft seas and palm trees. Exotic foods like breadfruit and mangoes and pineapples were abundant and he delighted in them, plucking them off of branches for breakfast or a mid-day snack. 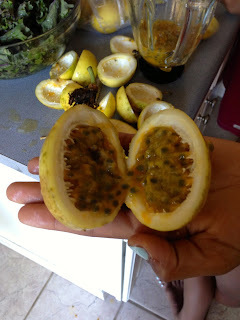 But one fruit enchanted Massi: lilikoi. He did not even know what it looked like. He'd only had a fleeting encounter with the it's seed-speckled nectar at a beachside tiki bar, in a lilikoi mojito. He'd smacked his lips after the first sip, eyes wide, and asked his friends, "But what is lilikoi?" His friends were not sure. They were new transplants to the island themselves, but they assured him that they would come back to the bar again. Days passed. Massi's time on the island was running out. There would not be time to get back to the bar. "Let's make it at home," his friends suggested. They went to the supermarket that morning to search for lilikoi juice. There was POG, and papaya and guava and coconut water, all kinds of packaged tropical juices, but no likikoi. They searched the produce section. There were abundant piles of egg fruit, passionfruit and apple bananas. No lilikoi. One night, while sipping rum out on his friends' lanai, they spotted a small, shiny, green fruit hanging from vines in the corner of their yard. "Could this be lilikoi? ", they wondered aloud. They clapped their hands in anticipation, jumped up from their seats and plucked one fruit off of the tree. They gathered around the candle lit table and someone sliced the fruit open with a knife. Strange black seeds slid out with slippery yellow juice. "No", Massi tisked. "This is passionfruit." The next day, the three friends went to an organic market. They found lychee and a small, yellow fruit that looked like the green fruit growing in their backyard. "I only see passionfruit," Massi shrugged. There was no sign on the shelf to confirm this, but before they walked out of the grocery store, Massi's friend moved on a hunch. She decided to ask for help. She picked up one of the yellow fruit and held it up to one of the cashiers, " Is this lilikoi?" "No," he shook his head and smiled at her ignorance. "Can someone help us find it?" Another woman led them back to the produce area. She picked up the very same fruit that Massi's friend held in her hand. "Here 'ya go," the woman said matter-of-factly. Massi and his friend froze in confusion, " This is lilikoi?" "But he just said that it wasn't." "It is lilikoi," she smiled patiently and placed the small fruit in to Massi's hand before she walked away. They bought two pounds because they did not know how much of what they needed was inside of each fruit. They wanted to make sure that they had enough to keep the mojitos flowing through the night. "How do we make the juice?" Massi asked as they buckled in to their car. His friend immediately opened her iPhone and began searching for recipes. "Oh my God!" she gasped from the back of the car. Massi jumped in his seat. "What?!" They were all silent for a few seconds. "What?" Massi asked again. English was his second language. He wanted to make sure he'd heard her correctly. 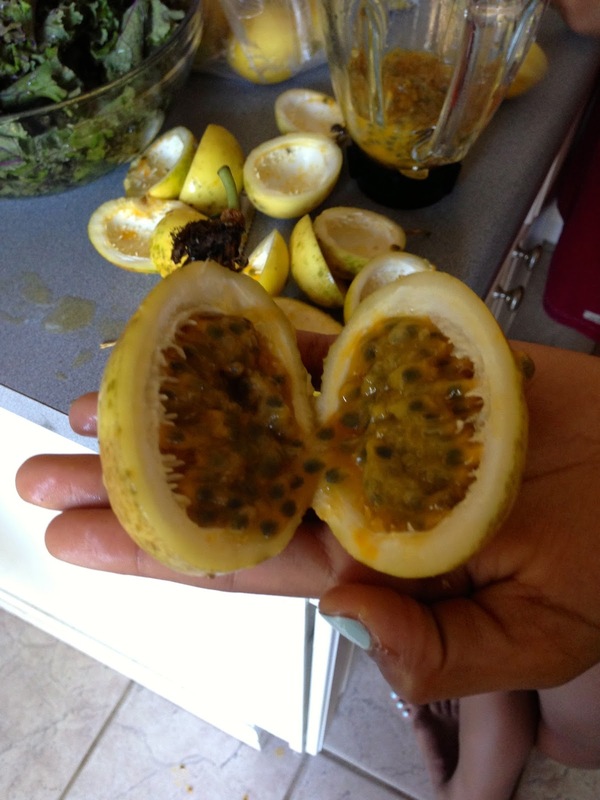 "Lilikoi is passionfruit! ", she repeated incredulously. They all broke in to hysterical laughter. This is the recipe for the elusive lilikoi puree. The sky's the limit with this one. Great for mojitos or margaritas or acqua fresca, even baked goods. Cut the lilikoi in half. Scoop all of the pulp in to a blender. Pulse with water for twenty seconds. As for Massi and his friends, they made many lilikoi mojitos and enjoyed them late in to the night. And they all lived happily ever after.